During Induction Week (more well known as Fresher’s Week!) 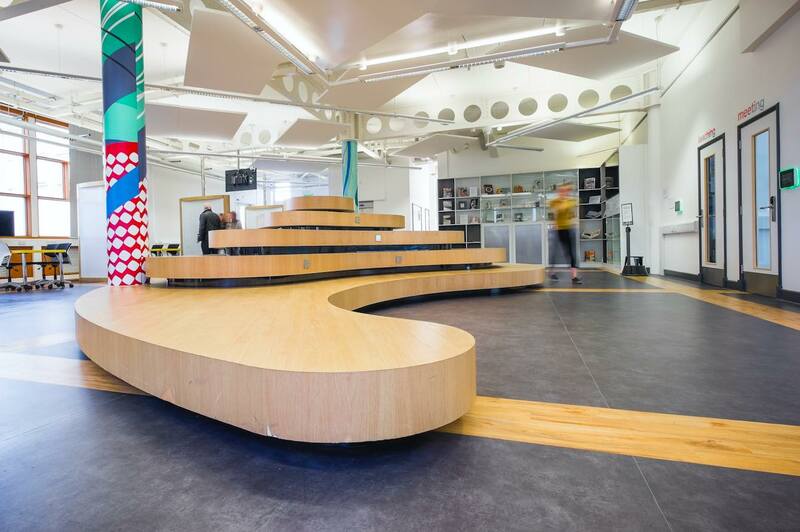 you may think that TheHub, the heart of Coventry University Campus, will be buzzing with activities, Domino’s Pizza and most importantly – FREEBIES! But if you look a little bit further into Lanchester Library, there is a whole lot more going on! 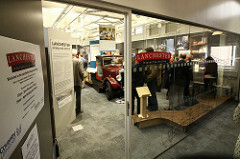 The Lanchester Library is named after Frederick Lanchester, one of Britain’s greatest engineers and inventors, and even has an interactive space dedicated just to him on the 2nd floor, open 10am-4pm every day! 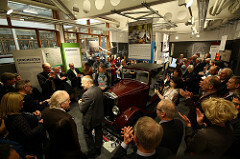 Learn more about the Lanchester Archive! IT support - need to loan out a laptop? This service is on the ground floor! Disruptive Media Learning Lab (DMLL) – located on the 3rd floor, change the way you think about your learning via different techniques and methods, why not introduce Lego to your assignments?! The DMLL has interactive spaces to help support your group work and independent study! SIGMA Maths Support – drop-in centre located on the ground floor and open 7 days a week during term time. 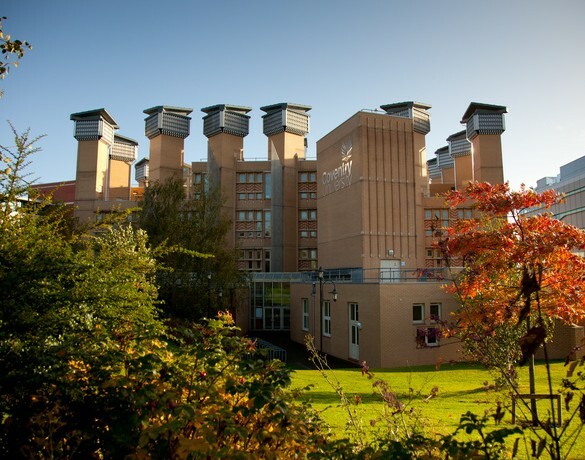 They provide help analysing data for project reports and dissertations. Office of Teaching & Learning (OTL) – we are up here too, on the 3rd floor, (DMLL), we connect and engage in all student experience, campus news, and support collaborative projects within the University Group. Subject Librarians – need some help with referencing your assignment or just some advice on using the library that is specific to your faculty and course? Then look no further! Your very knowledgeable subject librarians are based here in the DMLL, 3rd Floor of the Library and are happy to have a chat with you and guide you! Click Here to book an appointment with one of them! 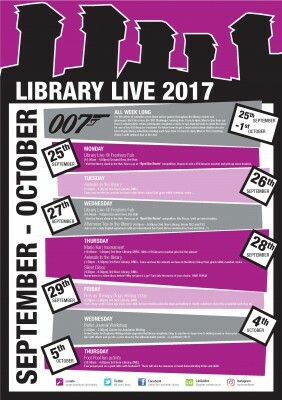 So, Induction Week – what you can expect from ‘Library Live’! 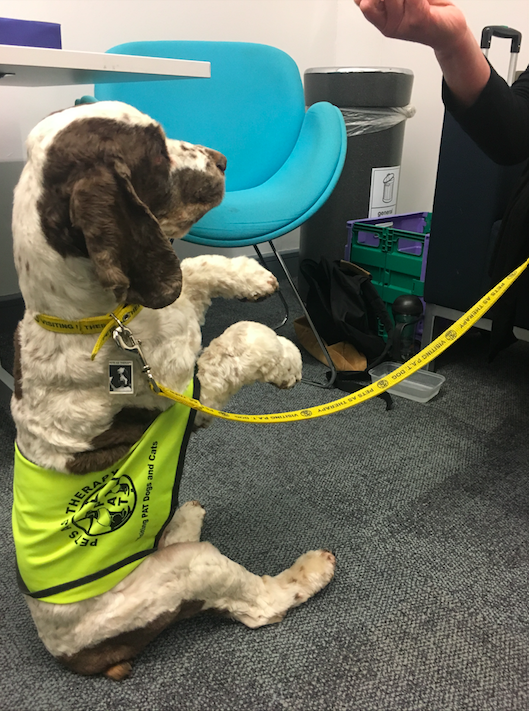 Come down to visit the Lanchester Library from Monday 25th September, there will be 2 weeks of exciting activities, games, competitions and even animals to welcome you on campus! Heres the full list of activities you can look forward to, hosted by Lanchester Library! You can meet the PAT Therapy Dogs on the 29th September in the Library! 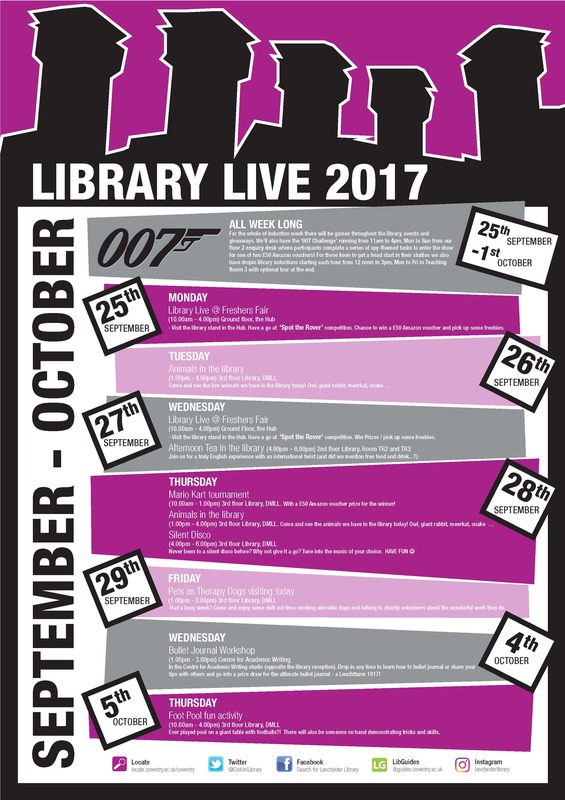 All week long there will be GIANT Jenga, Mario Kart games and even take part in the ‘007 Challenge’ which will throw you into a series of James Bond inspired spy-themed tasks to enter the draw for one of two £50 Amazon Vouchers! On Tuesday 26th September, between 1-4pm, prepare yourself to meet some live animals that are visiting the library! We just can’t wait to hold an owl, pet a giant rabbit, stroke a meerkat …. and snake?! Monday and Wednesday during Freshers, the library and OTL will be at The Hub with a stall – try and spot us for LOTS of freebies, handouts and friendly faces to welcome you to Coventry (and if you’re a returner) back to campus! If you want to have some time to be quiet and reflect on your action-packed induction week, then don’t worry – the library has a whole floor dedicated for silent work (1st floor) and is full of spaces where you can relax, read and take time to chillout! Freshers’ Week: What’s it all about?